Searching for a Cairn Terrier? The Cairn Terrier is everything a terrier dog should be – small, hardy, spirited, strong and gutsy. It weighs 10 to 14 pounds and stands at 23 to 33 centimetres at the withers. It is adaptable provided it is given plenty of exercises and mental stimulation. Cairns love their playtime and daily walks. They are highly intelligent, curious and quick to learn. No wonder Toto in the famous The Wizard of Oz was played by a female Cairn Terrier named Terry. Healthy Cairn Terriers have a lifespan of 12 to 15 years. Do you want your own Toto or Cairn Terrier at home? Here is a complete background information on this lively and devoted dog breed. The Cairn Terrier origins can be traced to the Highlands of Scotland and the Island of Skye more than 200 years ago. This terrier dog was originally bred to hunt vermin, foxes and rodents. 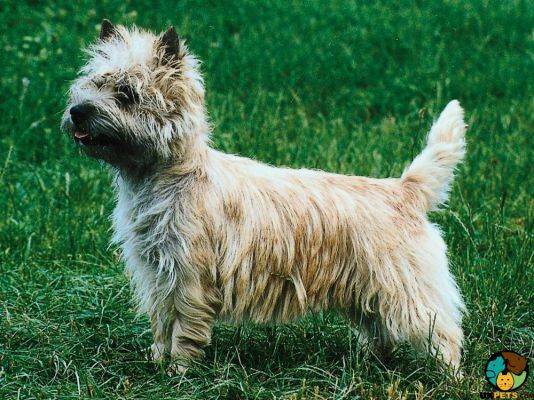 Cairns were initially grouped under the Skye Terrier class alongside Scottish Terriers and West Highland White Terriers. It was only in the late 19th century when breeders began to select for different characteristics of the Skye Terrier that three variations were recognised as separate breeds. In 1912, the Cairn Terrier breed was recognised and registered as a separate breed. In the same year, the breed also received the Championship status. The name Cairn was taken from the pile of stones that marked Scottish burial sites which are often the hideouts of vermin that terrier dogs hunt. Today, Cairn Terriers are known worldwide with over twenty breed clubs of enthusiasts upholding the breed standard. Cairns remain as one of the most popular companion dogs and family pets. The Cairn Terrier is a small dog, solid and well-muscled that sport a shaggy coat. This breed has a small broad head, defined stop and a powerful muzzle. Its jaws are strong with a regular scissor bite with upper teeth slightly overlapping the lower ones. 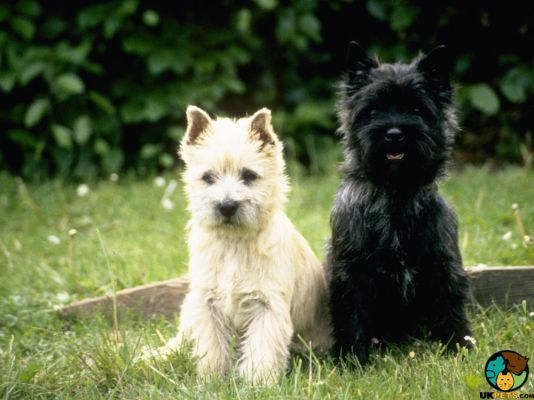 It also boasts of a black and shiny nose that adds to the Cairn’s charm. Cairns have dark hazel eyes that are set wide apart, shaggy eyebrows, and small pointed ears. This dog breed's body is well-proportioned with a strong neck, well-boned shoulders, compact and well-sprung ribs, nice level back, and supple loins. Cairns have short tails that are well furnished and sit high on its body. The Cairn Terrier sports a shaggy double coat that comes in shades of red, brindle, black, sand or grey. The double coat of the Cairn consists of a wiry topcoat and a soft and plush undercoat, giveing it the shaggy appearance. Its coat should be brushed once a week to remove loose dead hair. Bathing can be done once a few months or as needed. Cairns that are to be show dogs require some trimming using a stripping knife, which can be done twice or thrice a year. Other than grooming the coat and keeping it clean and tidy, it is important to also do basic care on their ears, nails and teeth. Weekly tooth brushing is required to maintain oral health and avoid dental issues such as gum disease, tartar build-up or bad breath. For cleaning the ears, make sure only to use veterinarian-approved solution. If Cairns don't wear down its nails naturally, then make sure to trim them on a monthly basis. Spunky, curious, brave and loyal – these are outstanding characteristics of a Cairn Terrier that were widely showcased in its role as Toto from the movie The Wizard of Oz. True to the character, Cairns are precisely that and more. They are also highly intelligent, independent and alert. Like any terrier, Cairns like to bark, dig and chase. Its prey drive is strong, which means chasing small animals is high on its list of fun activities. Early socialisation is crucial especially if a Cairn is to co-exist with other small pets in the house. Cairn Terriers are excellent companions for all families and are useful vermin hunters on farms. They are devoted canines that are happiest when with his family. They like to play with children. However, playtime with smaller kids must always be supervised because ironically, this breed also doesn't have a lot of patience and is known to bite. >Like all terrier breeds, the Cairn can be stubborn. When training this breed, one is required to show consistency and patience. Cairns must be trained when young and must be made to understand who is in charge in the house, or it will take any opportunity to bend the rules and run amuck. A typical serving of an adult Cairn Terrier is 1/2 to 1 cup of high-quality dry dog food divided into two meals. You can use a variety of food products such as a diet of kibble and premium quality canned or raw foods. Here is a typical calorie needs per day of a standard Cairn Terrier adult weighing 10 - 14 pounds. The amount of food in feeding depends on the size, age, and build and activity level of a Cairn.. The best diet for this dog breed is one that is natural dry food with meat as a base without synthetic preservatives, colouring or flavourings. The Cairn Terrier is a small dog that has a lifespan of 12 - 14 years. For the most part, Cairns are healthy dog breed but may suffer certain medical conditions like eye issues such as Craniomandibular Osteopathy, Cryptorchidism, Globoid Cell Leukodystrophy, Hypothyroidism, Legg-Calve-Perthes Disease, Patellar Luxation, Ocular Melanosis, and Portosystemic Liver Shunt. Cairns are high-energy dogs that need to be kept busy, or the lack of activity will likely develop into negative habits such as chewing and digging. Ideally, a Cairn must be exercised at least one hour every day. A securely fenced yard is required when a Cairn is off leash outdoors, or it will take the opportunity to escape. Getting a Cairn Terrier is not as simple as going to the pet shop and buying one. Certain considerations must be taken before you go down that road of dog ownership. Are you financially capable of raising a dog? If you doubt you are, here is a summary of how much it will cost to purchase and care for a Cairn Terrier. A Cairn Terrier puppy that is bred by reputable breeder will cost you £400 to over £500. Pet insurance, which you must avail if you want to offset some likely costs in the future, will cost around £19 per month for a basic cover and £40 a month for a lifetime cover. When it comes to food, premium quality dog food will set you back £35 to £50 a month. Taking a Cairn Terrier for veterinary routine checks and other procedures such as vaccinations, boosters and neutering will quickly add up to £1,000 a year. On average, you will likely spend about £65 to £100 to raise and care for a Cairn Terrier. This rough estimate does not include insurance, other medical treatments not covered by the insurance, professional grooming services, and obedience classes or training. 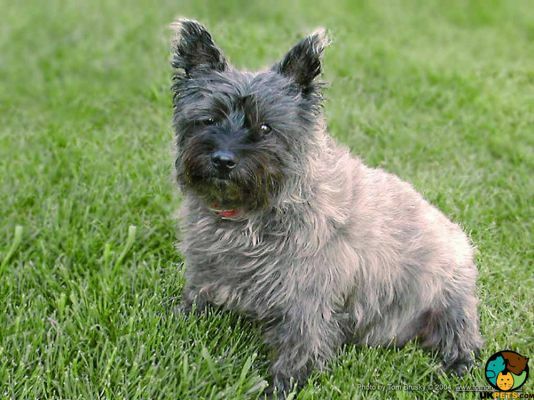 Is a Cairn Terrier Right for You? Cairns are small but tough dogs and should not be mistaken as a delicate lapdog. They make great watchdogs quick to alert owners. They don't shed much except in the spring and autumn. Cairn Terriers are highly-energetic dogs prone to digging and chasing. They have high-prey drive and may show potential aggression to other animals. They crave company and mostly suffer from separation anxiety.